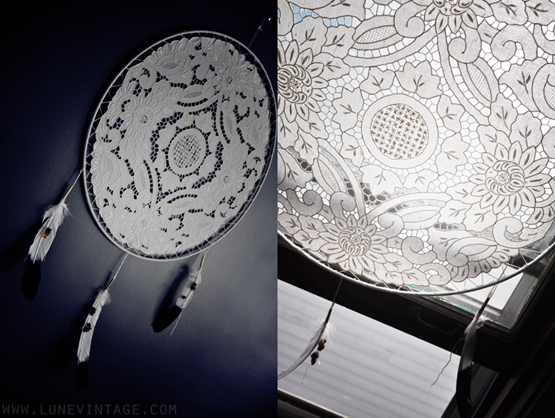 I found this beautiful piece of lace work and an over sized hoop while thrifting last week and knew it was the perfect combination to create another doily dreamer for our living room wall. I chose drilled raw amber paired with dyed tip gull feathers that resemble eagles feathers. 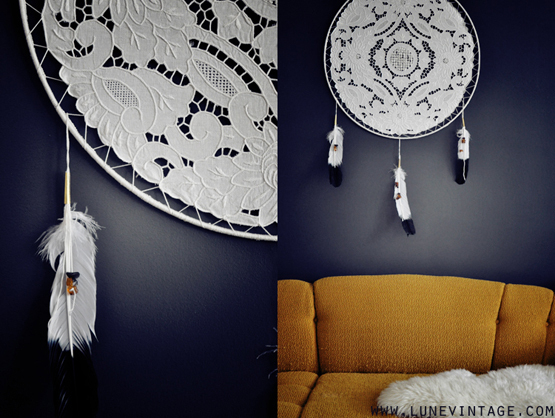 I love the simplicity of the black and white color scheme paired with the intricate lacework design. Just like last time I used a knotting trick to wrap the hoop. Here's a video on how I wrap a hoop! I used a darning needle and thin sock yarn to sew the lace tightly in place. It took a little different approach than the method we use for a doily dreamer, but it's still very simple. The trick is to sew first, and then secure one end before pulling the threads tight all the way around the hoop. Always pull tightly because there will be a natural stretching out with time, and a saggy dreamer is hard to fix. I'm so happy to replace the ikea print we picked out a few years ago for the living room. The red was driving me crazy, and its just too cold and graphic for the house. This is much better. 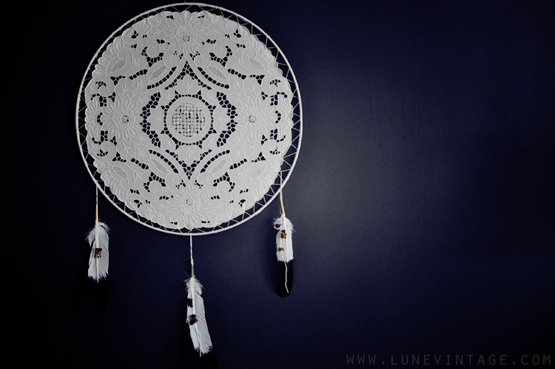 If you'd like to see our tutorial on how to make a doily dreamer using a thrifted doily - VIST HERE.